(MoneyWatch) Competitors to Microsoft Office -- and Google Docs in particular -- have made it ridiculously easy for two or more people to collaborate on the same document in real time. I frequently co-write an argumentative blog post with former CBS MoneyWatch contributor Rick Broida, for example, via Google Docs. It's a compelling solution because we can see each other typing in real time even though we are working 2,000 miles away from each other. If you've recently upgraded to the newest version of Microsoft Office, you might not realize that you can now do something fairly similar. It's not as simple or elegant, but then again, one could argue that nothing from Microsoft ever is. 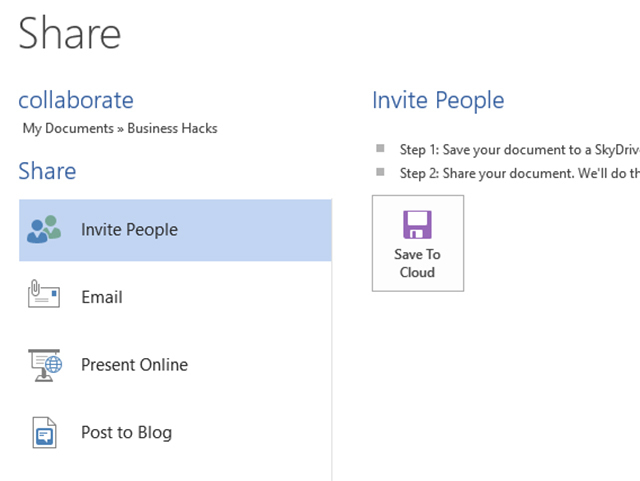 Open a document that you want to share and click File, Share, Save to Cloud. Save the document to a folder on your SkyDrive account. After the file is saved online, you'll see an option to invite other people to your document. Enter an e-mail address and make sure that the dropdown is set to "Can edit." Click Share. Your recipient will receive an invitation to join your document. If they have Office 2013 (or Office 365) installed, they will have the option to work in either Office on the desktop or Office Web App, the free Office-in-a-browser version. From that point forward, everyone can edit the document together. Some important caveats, though. First and foremost, you can't see each other's edits in real time, as you can in Google Docs. That can make actually collaborating somewhat challenging. Seeing your collaborator's edits is a two-step process. First, the person who made changes needs to save them by clicking the Save button. Then, a status bar notification appears on the other person's screen, advising that updates to the document are available. Click the notification, and the changes appear in the document, color coded by collaborator. And those limitations make the next problem worse: Only one person can work in the same paragraph at the same time. If you and I both start editing different ends of the same paragraph, there's no warning or caution; you find out that this has happened only later, when you try to accept the latest updates. At that point, a conflict resolution pane appears. This pane enumerates each conflict that can't be resolved, which you need to right-click to undo. All in all, I'll be sticking with Google Docs for my document collaboration needs, but it's good to see that Microsoft is starting to accommodate online collaboration; if you are locked into using Office, this kind of teamwork is technically possible. Beware, though, of the pitfalls and complexity if you decide to give it a go.